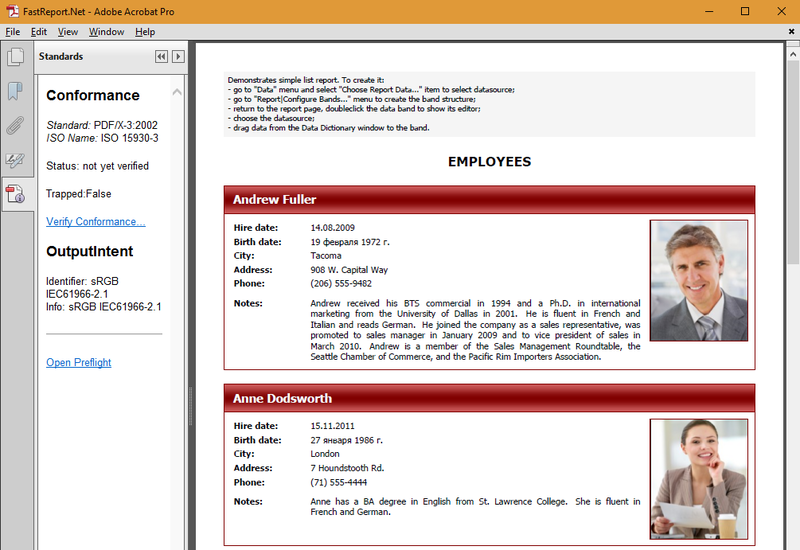 Saving a report in PDF/X format - Fast Reports Inc.
PDF/X format designed for the exchange of data, ready for printing. The idea is to create a document that can be printed on any printer identically. It is important for polygraphy, where it is important to print documents on any print device uniformly, whether the printer or plotter. PDF/X document contains color profiles for printers, due to which will be printed out exactly the color, which was conceived by the author. Thus, the standard PDF/X gives us guarantee of unchanging the final document. That makes PDF format ideal for document management in the sphere of publishing and polygraphy. The disadvantage of this format is the impossibility of use of properties: encryption, compression JBIG2 and transparent. • PDF/X-5. Based on PDF/X-4, allows external images. You probably noticed that the standard X-2 is located after X-3. It's not a mistake. Developers have created X-2 after X-3. Apparently they did not want a gap in numbering. 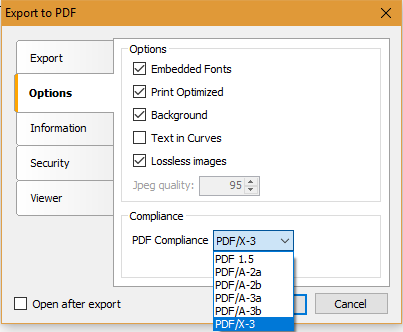 FastReport.Net supports export to PDF/X-3 format. Thus, later on we will consider its features. • Do not use transparency. If the file is printed with the bleed, you should ask BleedBox. It must be more than TrimBox / ArtBox, but less than the MediaBox. • The file must contain the ICC color profile, which specifies the color space CMYK. This profile should be implemented as OutputIntent. Added the new option " Lossless images". It allows you to use the original image without conversion to Jpeg. This is especially important for vector images and barcodes. The main differences in the "Compliance" section. Now you do not need to choose this option. The default is PDF 1.5 format. This is the usual Export as PDF. The list of compliance standards contains one more - PDF/X-3. Select it. The options of the "Security" tab will not be available. 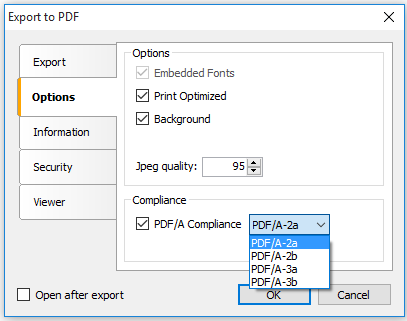 Open the export file in a PDF program Adobe Acrobat Pro. 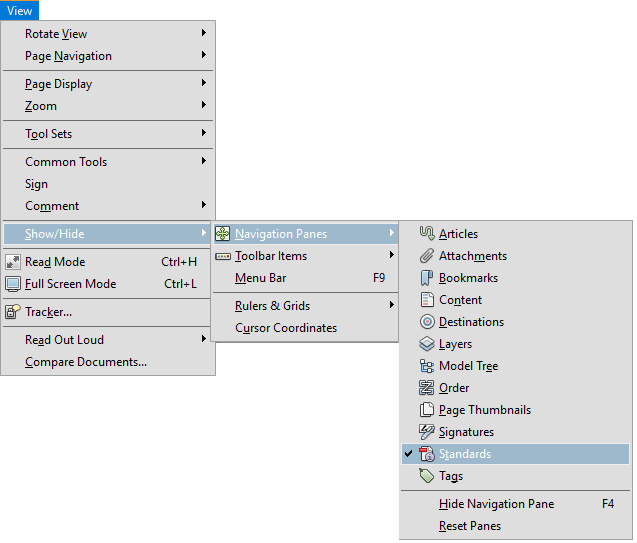 you need to open the panel "Standard" to verify compliance with the standard document. "View" opens the menu - "Show / Hide" -> "Navigation Area" -> "Standards". Thus FasrtReports reports become more useful, especially for polygraphy and publishing. Now there is no need to worry about repetition reproduction of a document on the different sources of print. The report will always look the same.